Jewelry is often the finishing touch to any fashion ensemble and can pull the entire look together. The right pieces will even quickly dress up a daytime work outfit for evening use. The problem is that most jewelry is small, delicate, easily lost and can be tangled or damaged if not stored properly. Try these tips to get your jewelry organized and protected so that you will be able to enjoy many years of use from each piece. 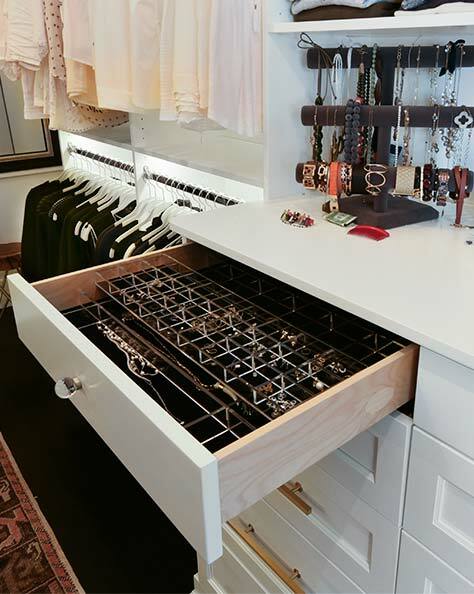 Use a combination of different jewelry organizers to store the different types of pieces including stands or containers for your dresser or usual place where you get ready in the morning, drawer organizers/dividers specifically designed for jewelry — possibly in conjuction with a drawer lock, hanging organizers for necklaces and a traditional jewelry box. Precious pieces should be wrapped indidually. Ring stand for the countertop or dresser: A ring stand is generally a shallow bowl shaped stand with a vertical post in the center. Everyday rings are stored on the center post, while the lip of the stand can be used for other small pieces like earings. Traditional jewelry box: Locate an attractive box or other container onto your dresser or countertop that you can drop your everyday jewelry into at the end of the day. This will keep it clean and safe until the next wearing, eliminating the chance of it getting lost. Necklace hanger: Hanging your necklaces will keep them tangle free and ready for use. There are several on the market including freestanding countertop versions, wall mount and pull-out necklace holders that install in your closet. The pull-out necklace hangers for the closet are especially good for organizing a lot of pieces that are not worn every day, as they keep the dresser or countertop free from unneccessary clutter. They also work well for many bracelets. 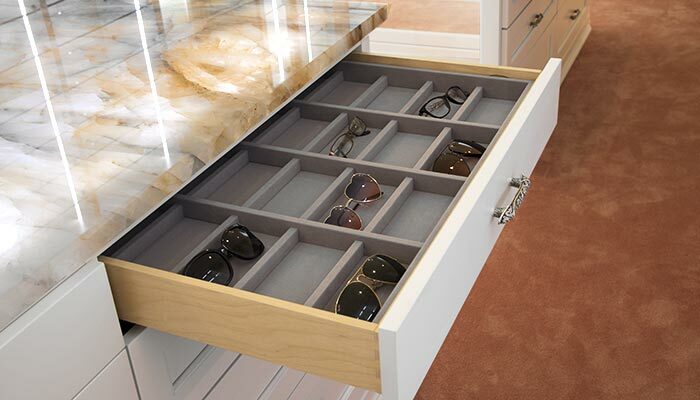 Jewelry drawer organizers: This category includes velvet drawer liners and drawer dividers designed specifically for jewelry, eye glasses or watches. The dividers are usually made of clear acrylic, wood ot velvet coverd molded plastic. The velvet liner on the bottom has just enough grip to keep pieces from jostling around when the drawer is opened or closed. It also protects the jewelry from scratches. The drawer dividers further protect the pieces, ideally by offering a separate section for each piece, and keep them from getting jumbled and scratched. Only use high quality, velvet lined or soft cloth storage for your expensive pieces and heirloom quality jewelry. This will offer the most protection. The jewelry should be kept out of direct sunlight and each piece should be wrapped individually or placed in it's own protective compartment. Some type of security is often desirable as well. Locking jewelry drawer organizers: Often the same type of drawer dividers used for your costume jewelry can be repeated for your more expensive pieces, as long as each piece is individually wrapped or in a cloth bag according to type as explained above. It is advisable, however, to include some type of lock on the jewelry drawer. There are different types on the market, but they generally fall into the category of traditional keyed locks or invisible stealth locks that include a remote control with keypad. They unlock the drawers after typing in a secret password/number. 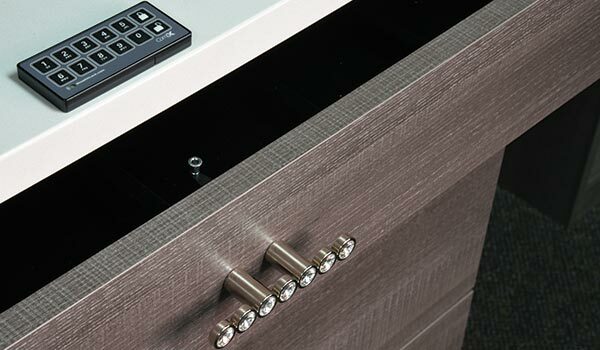 Locking cabinet: Any storage cabinet can be out fitted with a locking door. This is convenient for those who prefer to display elegant necklaces on a velvet covered bust. Velvet lined box or pouch for each item housed in a safe or vault: This solution offers the best security for truly pricey jewelry or even less expensive pieces with strong sentimental value. The safe can be a unit installed within the owners home for convenience. Many models of home safe are available. They run the gammut from a small closet safe or office safe to full blow "safe rooms" that are meant for more than just storage. Closet Works is Chicagolands' largest and most experienced provider of custom storage solutions. Since 1987, we have been helping homeowners by creating custom closets, pantries, bookcases and more to help organize their lives. Examples of our closet accessories including jewelry drawers and locks as well as custom storage solutions can be found throughout our website. For more information on Closet Works call toll-free at 800-4-CLOSET (800-425-6738). 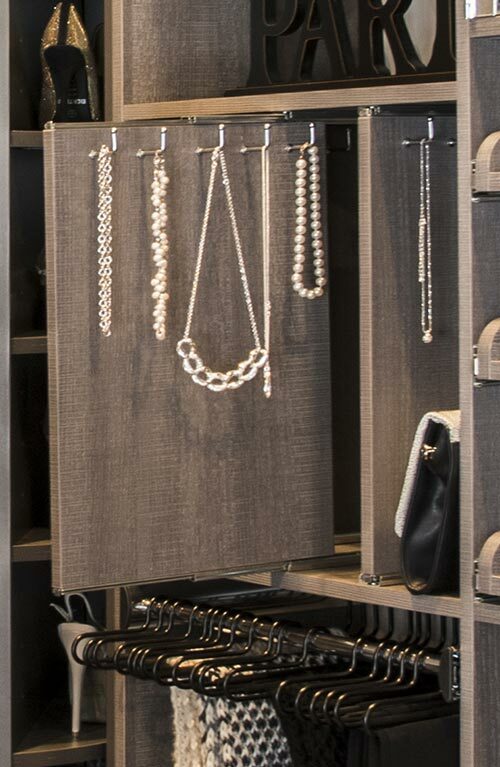 These hooks on pull-out panels are perfect for organizing fashion necklaces and costume jewelry. The number of necklace hooks and pull-out panels vary depending on need. Panels pull out in a similar fashion to a drawer, except that it is vertical. The panel recess with soft close when not in use. This custom wardrobe closet included two jewelry drawers. 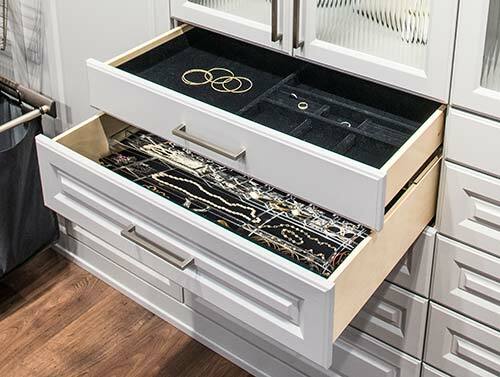 The top drawer features a divided velvet jewelry organizer. 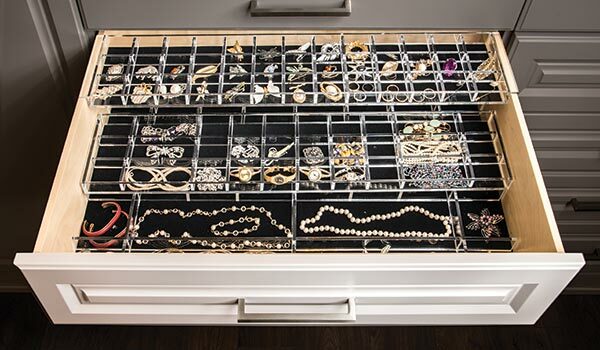 The second drawer includes a three tier acrylic jewelry drawer divider with velvet liner that organizes and protects many pieces of jewelry (also shown in the image at the top of the page). The acrylic walls of each compartment are adjustable and can be reconfigured to fit the size of the jewelry pieces. The second and third level trays slide back and forth to reveal the pieces stored below. Velvet jewelry dividers can also work well for storing a collection of eye glasses. They will protect the glasses and prevent the scratching of lenses. Countertop containers for everyday pieces in conjuction with a two tier acrylic jewelry drawer organizer with velvet liner were used to organize this collection kept in a dressing room style walk-in closet. 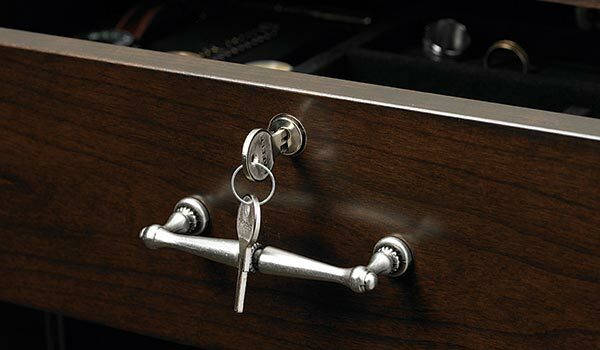 A keyed drawer lock can protect valuables. This programmable stealth lock remains unseen, but prevents unauthorized opening of a jewelry drawer.